To observe the corona surrounding the Sun, we have to wait for an opportunity to view a total solar eclipse when the Moon fully blocks the solar disk. In visible light, the bright solar surface hampers observation of the faint corona. Observations at shorter wavelength light such as ultraviolet and X-ray are appropriate to investigate the corona in detail. The high-temperature corona emits more radiation at shorter wavelength. However, ultraviolet and X-ray radiation cannot penetrate the Earth's atmosphere. That is the reason why we need a space observatory. The observational satellite Hinode's onboard instrument, called Extreme-ultraviolet Imaging Spectrometer (EIS), was designed for obtaining spectra of the solar corona. The extreme-ultraviolet is a wavelength range of the shorter wavelength region of ultraviolet radiation. We can find many spectral lines radiating from high temperature (higher than one million Kelvin) plasma. The most frequent lines are emission lines originating in ionized iron. Iron, with the symbol Fe, is atomic number 26 and will have 26 electrons. In such a hot corona, a part of the electrons is removed from iron atoms, and more electrons are removed at higher temperature. Analysis of the emission lines of the ionized iron yields information on the temperature of the corona. Image 1: A part of the extreme-ultraviolet spectrum obtained by the EIS installed on Hinode. Many emission lines caused by ionized iron are visible. For example, "Fe X" means an iron ion removed nine electrons from a neutral iron atom. Combining ratios between other iron charge states yields the temperature of the corona. In addition, analyzing the wavelength shift of emission lines, we will derive the corona's motion velocity. Column: Is the corona's temperature one million Kelvin? It is generally believed that the corona's temperature is one million Kelvin. However, plasma of various temperatures is distributed throughout the corona. "Warm" plasma has a temperature of about one million Kelvin, while "hot" plasma is higher than two million Kelvin. Moreover, super hot plasma with a temperature of higher than ten million Kelvin is observed when a giant solar flare erupts. 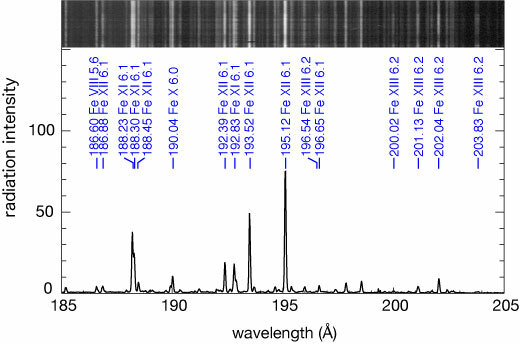 Studying the solar spectra at extreme-ultraviolet is essential to developing an understanding of the temperature distribution and the dynamics of the solar corona that has such a diversity of temperatures. Image 2: The solar corona's image in the extreme-ultraviolet emission line of an ionized iron. The typical temperature of each iron charge state is indicated. Extremely Metal-Poor Stars - to what extent can we measure small amounts of elements? © 2011- National Astronomical Observatory of Japan.